This sweet Folding Mirror measures 52cm x 62cm when folded and opens out to measure 102cm. This pretty Arch Mirror measures 1.52m x 47cm x 3.5cm is just beautiful and will make a statement piece in your home. Pick up only. 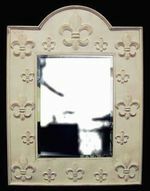 This lovely Mirror measures 65cm x 90cm and has a pretty French Appeal. Pick up only.